The film adaptation of Tracy Letts’s Pulitzer Prize winning play “August: Osage County” is the intense story of the Weston family in all their pain and unimaginable dysfunction. Receiving her 18th Oscar nomination, Meryl Streep stars as the Weston family matriarch Violet Weston, and Julia Roberts, nominated for best supporting actress, costars as Violet’s distant daughter Barbara. Violet and Barbara, as well as the other two daughters, dutiful, caretaker Ivy (Julianne Nicholson) and flighty baby sister Karen (Juliette Lewis) are brought together along with extended family members in the face of a family crisis, the disappearance of husband and father Beverly Weston (Sam Shepard.) As marketed, many viewers who expected to see a mildly dark comedy about the difficulties inherit in families are shocked instead to find a brutal film that chronicles mean spirited dysfunction at its worst. Viewers unfamiliar with the story will discover the level of vitriol is similar to the levels of violence in Quentin Tarantino films and feel, with justification, that they have been the victim of movie of bait and switch. The disingenuousness of the marketing is unfortunate on two levels. First it exposes some viewers to content they knowingly would choose not to view. Second, by antagonizing the viewer’s expectation, many had a negative reaction they would not have experienced had they known the film’s true demeanor, and therefore were not fully able to embrace what was a good film with an outstanding ensemble that addressed important issues that negatively impact families. “August: Osage County” lays bare the reality of the ease in which family habits and behaviors, in this case negative, are passed on from generation to generation. Failures and disappointments in one’s life lead to unrealistically high hopes and expectations for offspring. Disappointment sets in when such expectations of the children are not met which then produces guilt felt by the child that then leads to their feelings of failure and disappointment as the dysfunction cycle prepares for the next generation. In this film, three generations of such behavior are on display at various stages and a fourth is brought in via a heart wrenching story. When not addressed, such dysfunctional habits replicate themselves like a virus. In the film, the Weston family has not addressed such practices, and has done what most families do, left things unsaid, undertaken inappropriate behavior, and moved to separate corners. Viewers watching this familial tragedy unfold learn two hallmarks of family systems theory, one cannot simply outrun one’s family as the power of dysfunction can span across time and space, and one cannot “fix” a member of the system without addressing the system as a whole. As hard as it is, such dysfunction and broken systems can be repaired but not without intentionality, openness, honesty, and determination. When confronted with change, the system will fight and bite back to keep the status quo. As in many families, the genesis of the Weston’s dysfunction is secrecy. Family secrets are best described as cancerous. They grow silently, feeding usually off the fear of shame. The energy expended, the lies built on top of lies necessary to keep “The Secret,” secret, brings stress and places unsustainable demands that negatively impact everyone in the family and all others who venture into the family’s orbit. 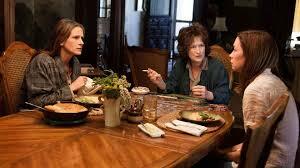 “August: Osage County” is a hard film to watch and worthy of its R rating. There are parts that are laugh out loud funny, and there are parts that are achingly sad and difficult. Many or most viewers will see touch points between their family and the Westons, hopefully these are only points and not a full reflection, and also hopefully they will be motivated to take action where necessary to address and repair, or at least understand, the dysfunction they live(d) with before it does more damage or is passed on to other generations. This entry was posted in Faith Shots, Film Shots and tagged August: Osage County, Beverly Weston, dysfunction, faith and film, family dysfunction, family systems theory, Julia Roberts, Meryl Streep, movie review, Violet Weston, Weston family. Bookmark the permalink.